Serving the public in Congress requires many resources: staff to help constituents, study legislation, communicate with the press and others; office space in Washington and back home; office supplies, and plenty of others. To cover the costs of these resources, the House of Representatives provides each Member a budget called a Members’ Representational Allowance, more commonly referred to as the MRA. The public rightly expects Members to use their MRAs responsibly, and Congress benefits from the public holding it accountable for its stewardship. So the House Chief Administrative Officer makes Members’ spending available for the public to examine. Spending records are published as the Statement of Disbursements of the House in both print and digital, searchable formats. These records are published quarterly and may be downloaded from the House of Representatives website as PDFs or CSV files. The records for each Member include who was paid, the amount paid, and a brief description of good or service that was provided. How much money is in each Member’s MRA? The amount of money in an MRA varies from Member to Member, and a set formula determines its exact size. The formula takes into account staff salaries, general office expenses, travel and office space. The amount for staff and general office expenses are the same for each office. The number of residential addresses within a district, its distance from Washington, and the price to rent office space in the district are variables that determine the size of the MRA. If a district is far from DC, has many inhabitants or has expensive real estate, there will be a larger budget than a rural district close to Washington. Although the MRA is calculated on certain assumptions about how Members will use their budgets—X dollars for staff salaries, Y dollars for travel, etc.—they have broad discretion in actually setting their spending priorities. For instance, the 2018 MRA formula assumes $944,671 for staff salaries, but 265 Members (more than half the House) spent more than this. Among the 10 highest MRAs, California, with its huge population, expensive urban areas, and great distance from Washington, is represented 4 times. Two of these districts are in the Los Angeles metropolitan area, one is in the San Francisco Bay area, and the last is close to Sacramento. Two more of the 10 districts with the highest MRAs are wholly within New York City. By contrast, more than half of the Districts with the 10 lowest MRAs are east of the Mississippi River. The way that Members actually use their allowance reflects, at least to some degree, the differences in the formula to determine the MRA. For instance, the 10 Members who spent least on travel represented districts that are either in the DC-Metro area, the Mid-Atlantic or New England. Of the 10 who spent most on travel, half came from Western states (including Alaska) and two came from U.S. territories (Guam and the Northern Mariana Islands, both of which are in the Pacific Ocean). How can Members use the MRA? Many rules govern how a Member can use the MRA. Sources of regulations include Federal law, House rules, and guidance from the Committee on House Administration. Improper spending of a Member’s MRA could result in prosecution under the Federal criminal code. According to the Members’ Congressional Handbook, which the House Administration Committee produces, the MRA may be used “to support the conduct of official and representational duties” for “ordinary and necessary expenses” within the country. Examples of “official and representational duties” include work related to legislative affairs or helping constituents who are having issues with the Federal Government. The Handbook notes that it contains “broad descriptions” of permitted expenses but does not address everything. Members and staff with questions about whether an expense is permitted should call the Committee before spending. Members and staff need to tread carefully in their use of government funds; failure to do so can jeopardize their careers. In recent years, a Republican former Member was charged with theft of government funds. The case was resolved by a deferred prosecution agreement, where he acknowledged that his “actions or inaction may have caused…the House to pay expenses that [he] knew or should have known were not properly charged to” the government. (Although the former congressman acknowledged these actions, he did not plead guilty. Rather, the government agreed to drop the charges if he did not violate the law for six months and pay the government for back taxes and his campaign committees for various expenses. Additionally, he contends that the actions were “mistakes” but “not crimes.”) On the other side of the aisle, in 2010, the House censured a prominent, long-serving Democratic Member for, among other infractions, using official stationery to solicit donations for a center named after him at a college. 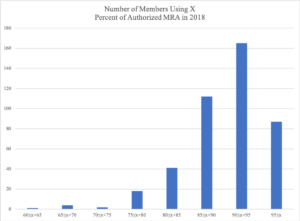 When do Members receive their MRA? Who decides how much is in the MRA? The MRA does not roll over from year to year. Additionally, Legislative Branch appropriation bills routinely carry provisions requiring that leftover funds be used for deficit reduction (or debt reduction, if there is no deficit). For instance, this provision can be found in section 110 of the Legislative Branch Appropriations Act for fiscal year 2019. Calculations based on the 2018 Statement of Disbursements suggest that the amount Members spent as a percentage of their authorized MRA ranged from a low of 60.66 percent to a high of 99.29 percent. A plurality of the Members used between 90 and 95 percent of their authorized MRA. The average percentage of the MRA spent was 90.17 percent, and the median was 91.34 percent. According to House rules, Members are required to cover overages personally. They may not use campaign funds or slush funds from other sources to subsidize their official activities. How has the MRA changed over the years? The MRA was first appropriated in the FY 1996 Legislative Branch Appropriations Bill. Prior to this, Members received separate budgets for staff salaries, mail, and other expenses. Creating the MRA consolidated these expenditures into one budget. From 1996 through 2010, the MRA increased each year. When John Boehner became Speaker after the 2010 election, he insisted on significant cuts each year from 2011 through 2013. Since 2014, MRAs have increased annually (with the exception of 2015, when it remained the same as the prior year).